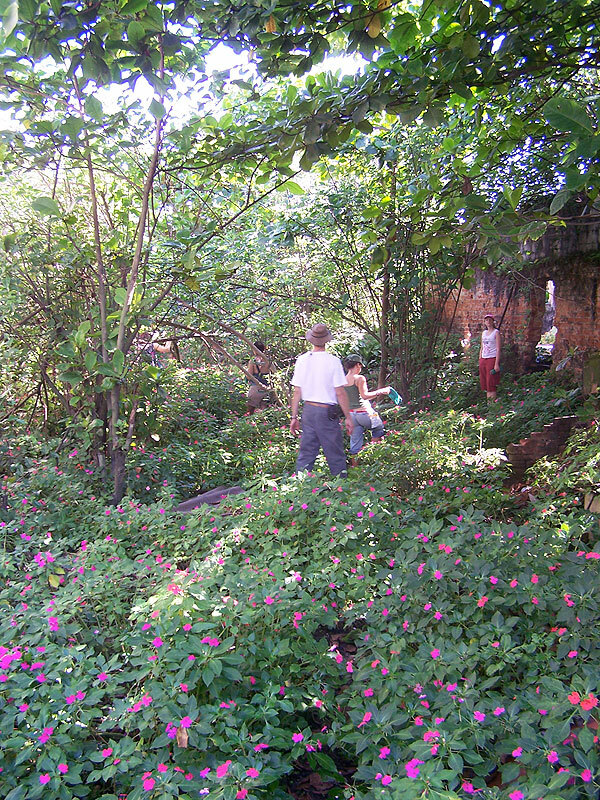 Walk a few blocks down from Apene, and you’ll find the site designated for the jardim das crianças, the promised children’s garden. It can’t be true! 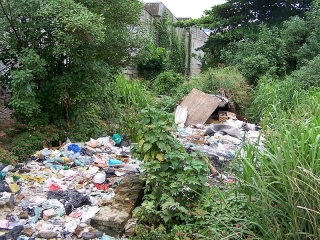 Where once stood a multi-story home, its arched façade proclaiming its colonial Portuguese heritage, now towers a pile of refuse and rubble more than eight feet off the ground. You duck your head to pass through the entryway and scramble up the 45-degree slope into a world that’s like nothing you’ve ever encountered. There, in front of you, is a yellow brick road of trash, beckoning you to follow its path. You step gingerly on headless teddy bears and cracked pipe fittings, rotting banana peels, crusty yogurt containers and stained coffee mugs. Baked in Brazilian sunshine, the stench is staggering. Up ahead is a tiny shelter, no bigger than a doghouse with a makeshift plywood roof perched against a remnant of a brick wall. Smoke is pouring from the darkened space. Someone lives here! A man crawls out of the shelter to check you out. It is impossible to tell his age. He tells you about his home—how about fifteen years ago, there had been a fire and the landlord let the tenement fall into disrepair; how the squatters gave it up after four years and the site became a neighborhood garbage dump. Now he is the only one left, and he points you toward the back half of the old building and invites you to explore. You shuffle past the shelter and gasp at the beauty that explodes in front of your eyes: an Emerald City of life—carpets and walls and rafters of green dotted with splotches of pink. Jungle vines reach skyward and twine around ancient fortress walls. Birds nest in hidden crags that once formed rafters. Even this place can’t resist Brazil’s dogged commitment to create life. A jardim das crianças here? Absolutely. Yes. So you begin with these mountains of trash, attacking them with pickaxes and shovels, gaining on them by only inches per hour. Today, five children show up to help you collect the loosened bricks that will become the stairway entrance. Tomorrow, they’ll bring ten more children along to help build the garden and then ten more after that, including an 11-year-old boy nicknamed Boizinho who wants to man your wheelbarrow. From that day on, he’ll be there in the garden every day, waiting to greet you and spending the day by your side, working and playing and singing songs with you—no matter that you don’t speak a word of Portuguese. Each day, more workers will appear, neighbors bearing gifts of shovels and wheelbarrows and the sweat of their labor. One day, bags of sand and sod will be dropped off—nobody knows by whom—so you can lay down a lawn and create a sand garden. A pile of old vinyl records are discovered, which the children paint and hang off of old crossbars to create luminescent chandeliers. This oasis has magic in it—a magic that beckons people to stop by, to contribute, to create something beautiful together. There is no blueprint for this garden. There are no foremen. Everything is a constant process of discovery and creation. Messes happen. Sometimes one person builds half a wall and then someone else comes along and tears it down to start another. Redundancy happens. There is chaos and confusion—and there is also laughter and joy and pride. There is wild self-expression as children design their own rock gardens and declare that the jungle must be preserved, for it offers places to climb and to hide. Yes, there are architects among us. 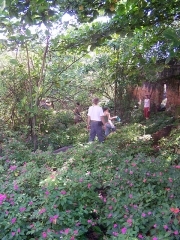 There are urban planners and permaculture farmers. We have expertise. But instead of relying on our expertise, we all pitch in wherever we can, and a community is rediscovered. Together, we become garbage collectors and ditch diggers and bricklayers—side-by-side with the eight-year-olds and eighty-year-olds who will be visiting this garden every day.